Bipolar disorder, also known as manic depression, is a mental health condition that can cause extreme mood swings with emotional highs and lows. For women with manic depression passing through menopause, symptoms can worsen due to fluctuating hormone levels. For those who don't have it prior to menopause, symptoms can become so severe that they resemble those of bipolar disorder. Continue reading to learn more about manic depression tests and treatment options available to finally get back to your routine with better behavioral and sleep patterns as well as heightened concentration. 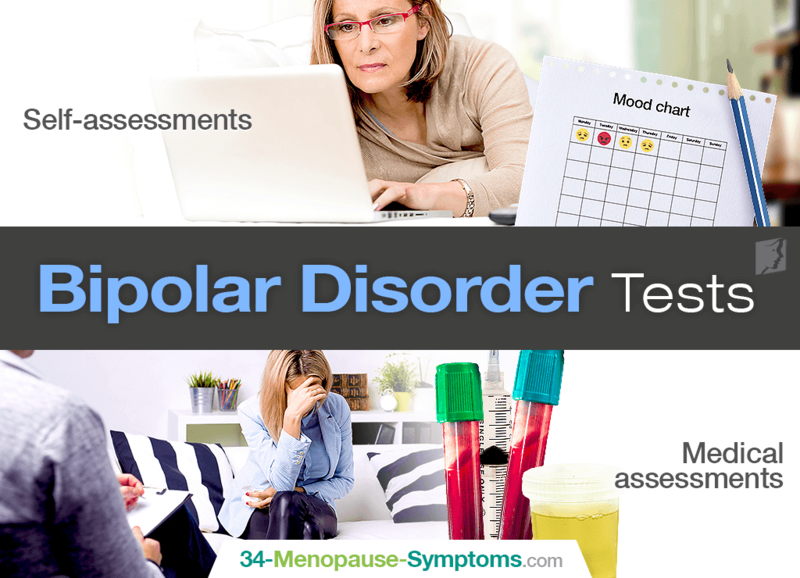 Bipolar disorder tests have the ultimate goal of assisting a woman in diagnosing her signs and symptoms of depression and bipolar disorder. They are separated into two categories: self-assessments and medical assessments. You may feel inclined to chart daily mood patterns from week to week to try and find a pattern in emotions. Keeping a daily record of sleep schedules could also help you identify a lack of sleep that could be causing drastic changes in moods. Over the last two weeks, have you been feeling hopeless with little energy and extreme tiredness? During periods of “ups,” do you feel more hyper than you normally do during periods of happiness? Have there been times when you were so irritated that you shouted at people or started arguments without reason? Do thoughts race through your head without you being able to slow down your mind? Are there times in which you have extreme amounts of energy? Have you done anything others would consider excessive, foolish, or risky of you? Are you easily distracted to the point where you have trouble concentrating or staying on track? While it is possible for women to perform self-assessments for bipolar disorder, it would be wise to go into a doctor for proper diagnosis. More often than not, the condition is treated with psychological counseling as well as medication. Your doctor will first perform a physical exam in attempt to identify any underlying health conditions that could be causing symptoms similar to those of bipolar disorder. It is worth mentioning that a physical exam in and of itself cannot confirm bipolar disorder; however, it can help pinpoint the diagnosis by identifying illnesses that cause symptoms of bipolarity. For example, hyper- or hypothyroidism can produce symptoms similar to those of manic depression. For menopausal women, tests of various hormone levels will be taken to confirm that manic depression-like symptoms are caused by reproductive hormone changes. Research has shown that greater mood symptom severity in bipolar women is worsened in the years leading up to menopause. Further laboratory tests and imaging may include a urine toxicology screen, complete blood count, fasting glucose and lipid assessments, MRIs and more to correctly diagnose the root of the symptoms. Your doctor may recommend you visit a psychiatrist in order to talk about a history of your behavior patterns, feelings, sleep schedules, and more. During the psychiatric assessment, you may also be asked to fill out a psychological self-assessment, which could include aforementioned questions. At the same time, close friends or family members may be asked to provide observational information. What Do I Do If I Am Bipolar? Women who are suffering from manic depression-like symptoms throughout the menopausal transition are advised to first start with lifestyle changes before pursuing medicinal options. Some lifestyle changes include creating a healthy routine to help balance moods, keeping a mood chart to better identify potential triggers, and forming healthy relationships of those of positive influence. Further treatments for depression and bipolar symptoms include supplementing your diet with phytoestrogens to encourage hormonal balance and taking hormone-regulating supplements, such as Macafem, to ultimately help restore natural hormonal production. Those suffering from manic depression due to other underlying causes should consult with their doctor for best treatment options tailored to their specific case. In conclusion, women entering menopause experience drastic mood shifts that can be caused by bipolar disorder, known as manic depression, or hormonal fluctuations that resemble the symptoms of bipolar disorder. Luckily, they have various resources available for them to confirm diagnosis. Self-assessments of mood charts and online tests can help steer them in the direction toward confirming the health condition later through various medical assessments, including laboratory tests and imaging and psychiatric assessments. Find comfort in knowing that this life-changing condition can be managed once and for all with proper vigilance and treatment. Stress and Depression: Is it Cause and Effect?